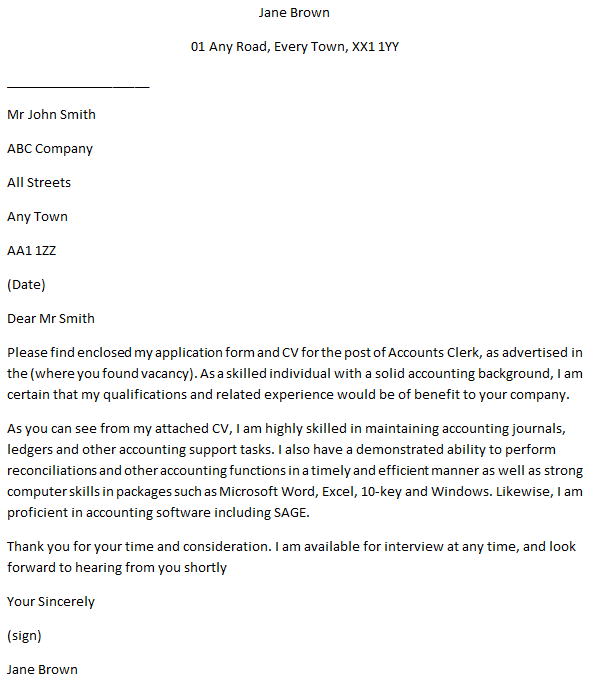 Writing a cover letter for the job role of an Accounts Clerk. The role of an Accounts Clerk is also referred to as a finance clerk or bookkeeper, and they work in all types of businesses and organisations, keeping financial records up to date and helping to prepare accounts. Entry requirements are GCSE qualifications (grade A-C), including maths and English. A levels in business studies, maths or economics could also be useful. An Apprenticeship scheme may offer another route into this career. Please find enclosed my application form and CV for the post of Accounts Clerk, as advertised in the (where you found vacancy). As a skilled individual with a solid accounting background, I am certain that my qualifications and related experience would be of benefit to your company. As you can see from my attached CV, I am highly skilled in maintaining accounting journals, ledgers and other accounting support tasks. I also have a demonstrated ability to perform reconciliations and other accounting functions in a timely and efficient manner as well as strong computer skills in packages such as Microsoft Word, Excel, 10-key and Windows. Likewise, I am proficient in accounting software including SAGE.